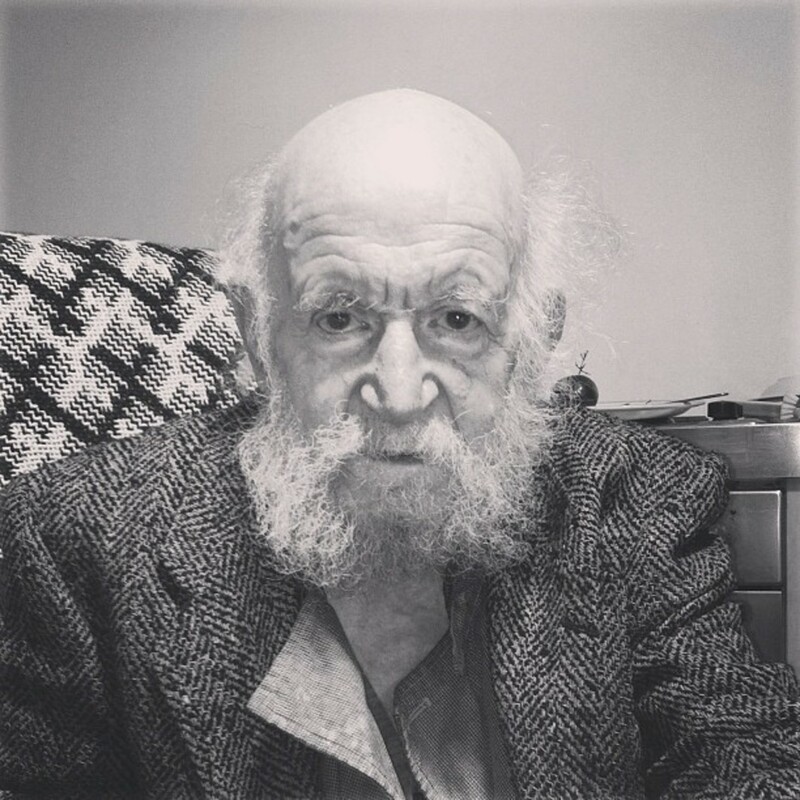 Gustav Metzger, 2013. Photo: Hans Ulrich Obrist. I heard of Gustav years later. I was on an eight-city lecture tour of the UK with not much to lecture about because I was only twenty-three. To avoid embarrassment, ten minutes into my talk I would always put on a Fischli & Weiss video while I went out for coffee and a cigarette to gather my thoughts. It was quite an exhausting trip but one that ended in Glasgow with a moment of total ecstasy: I discovered the amazing Scottish arts scene. Roddy Buchanan, Jonathan Monk, Christine Borland, David Shrigley: I met them all in one night. And Douglas Gordon too, of course, which was the beginning of a lifelong friendship. I was reading about Robert Rauschenberg at the time and was taken with his idea that paintings could be clocks. Douglas told me of two British artists just as relevant to my interests: John Latham—whose time-based art we are currently showing at the Serpentine—and Gustav Metzger. On the subject of extinction, Gustav used to say: The work is never done. This is what led to Remember Nature, the education project and worldwide day of action that began with a single piece of paper torn from his notebook. “This appeal is for the widest possible participation from the world of the arts,” read his call to arms in agnès b’s publication Le Pointe d’Ironie. “The aim is to create a mass movement to ward off extinction.” He wanted to do something with the Royal Institution too, but they did not pursue it, perhaps because of Gustav’s anti-institutional stance. No matter. He was fighting extinction in other ways instead, inventing a new extinction handwriting for my ongoing Instagram project. Gustav was involved in anticapitalist, anticonsumerist movements all his life. In 1961, he was even imprisoned briefly for encouraging mass nonviolent civil disobedience as part of the Committee of 100, the prominent British antiwar group. But what brings so many younger artists to Gustav besides his radical politics? I think it goes back to the transdisciplinarity that existed in the 1960s—that freedom to navigate between different fields. The more I read of contemporary science, the more I see interesting parallels with Gustav’s early writings and time-based work, all of which gain new meaning when we talk about the end of certainty, the dilemmas surrounding determinism, and the idea that there is no such thing as a secure or given future. Gustav was unwell for the last few months of his life, yet still he worked until the very end. I visited him the week before he died, and during our conversation he encouraged me never to stop the fight. Then he asked for a piece of paper, which he crumpled into his palm and for fifteen minutes moulded with his hands until it became this strange, beautiful sculpture, the very last work he created. Watching him work, it could have been 1959. A contributing editor of Artforum, Hans Ulrich Obrist is artistic director of the Serpentine Galleries, London. For additional Gustav Metzger Passages, see the forthcoming summer issue of Artforum.